Vaporwave is one of the most unusual music genres I think I’ve listened to in quite sometime. Inspired by postmodern Japanese culture, technology, pro-consumerism, and retro aesthetics, it’s also focused on sampling and remix culture. Considering it’s also a very easy music genre to become active in, there are hundreds if not thousands of artists like Hong Kong Express, telepath telepath, PZA, Cats Corp., and the two artists I’m gonna be talking about today: Luxury Elite and Saint Pepsi. Both have innovated the genre in their own ways, with Luxury Elite with more business approaches to it, in the aesthetics you see in albums like Moods and World Class, and Saint Pepsi invented the classic and now immensely popular future funk sub-genre, so when I found out they both had a split album out entitled “Late Night Delight”, I was quite prepared for it. Now, a disclaimer. There are three bonus tracks that can only be found on the cassette runs of the album. Fortunately, someone uploaded all three in one continuous listen, so I’ll be talking about those tracks. 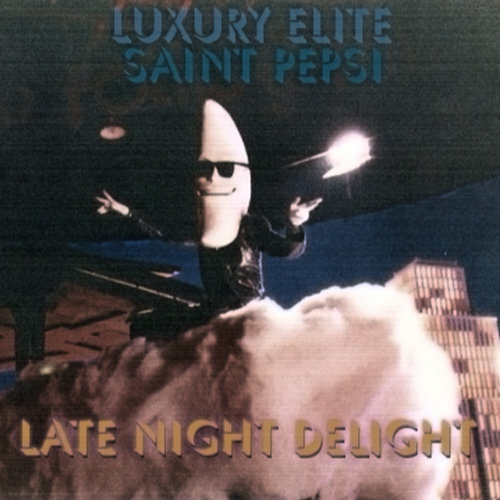 Luxury Elite’s songs are tracks 1-8, and it begins with the song “All Night”. The song itself contains samples of the Michael Jackson classic “Rock With You”. The song Luxury Elite created is only about 46 seconds, but it’s an effective introduction to an album about those late night escapades. “Mild Seven” is the next track right after, and samples “A Few More Kisses To Go” by Issac Hayes, which was also used in “Tonight’s Da Night” by Redman. This song is a bit longer than the previous, though not by much. It’s still very slow and groovy. I feel like I could fall asleep listening to these songs, it’s soft and sincere. “Crusing” is up next, this time the sample is unidentifiable. It’s still a slow jam-like song, definitely fitting in with the tone of the album, Luxury Elite brings the feels. “Schaumberg” is the fourth track, sample once again unknown. It’s the most pop-like track on the album, I believe at some parts in the song it has a guitar used in it directly. Actually, it’s more like a pitched and sped-up version of a slow rock song using an electric guitar. “Yeah” returns to the soft and slow tone as the previous songs, though the sample is as elusive as ever. It gives the feelings of a meetup at a cafe, or a diner, standing in the rain and waiting for the girl to pass by. “Nightlife” (sample unknown again) continues the tale of late night feelings as a casual conversation starts up and immediately goes to a more sincere and sensual route, it’s romantic a bit. “Beauty” then adds right onto the romantic feelings with an actual identifiable sample, this time it’s “Information From Night Wind” by Kingo Hamada, from an animated OVA called Heart Cocktail. Even the songs’ samples add into the tone and feeling of the album, everything is connected in one way or another. “Silk” goes right to the kiss scene, and doesn’t let up on the romance from here on afterwords. It’s the slow romance song in every cheesy 70’s film, those inner feelings of love and triumph. Onto the bonus tracks. The three bonus tracks are all bonus tracks by Luxury Elite and Saint Pepsi, two are collab efforts. “Sizzling” starts up the bonus songs, and it’s funky fresh yet still slow and soft, with those hints and dabs of love spread throughout, this track by Luxury Elite herself. “Tonight” is a song by both artists involved, and it’s returning to its ambient and jazzy roots from earlier in the album, leaving out the romance for more insight into our characters and their own feelings. “Champion” is the last collab track, and the last bonus track. It’s also my second favorite song on the album, no lie. It’s very triumphant, very empowering, and even more amazing with the artists’ skill involved, their personal ways of making music combine to create something special. Now we get to Saint Pepsi’s songs, tracks 12-20. “Mac Tonight” is a reference to the old McDonald’s Moonman ads, this specific track sampling “Easier To Love” by Sister Sledge, more groovy and less loving than the other songs, it’s just a big old dance scene song. “Can’t Afford” is the thirteenth track, and is named after the song by 52nd Street, which it also samples from. It’s more like a slowed down breakdancing song, from movies like Breakin’ and Beat Street, movies like that. I imagine if you sped this song up, it would get really funky and the room would be come a mess of electric blue and neon green. “Need You Tonight” follows right after that, keeping the same funky tone as the other tracks on the list, which samples “I Need You Tonite” by A Certain Ratio, the extended 12″ version. The original song sampled is fairly funk in its own right, but this song takes it to a whole new level. “Shakealong” is the fifteenth track after the previous song, this sample being unidentifiable, though my sneaking suspicion is that it’s sampling “Do Your Dance” by Rose Royce. It’s still very dance-the-night-away like, I’d stand up and dance to a slow jam all night if I had the patience and energy to do so. “Behind The Mic” is the seventeenth track, and sample is unidentifiable, though it doesn’t mean anything if the sample is unidentifiable or unknown, what matters is the quality of the music. Boy, does its quality shine through. It’s complex, lively, upbeat. It’s very unique. “Number One” is the most slow disco-like track, and it’s very fun to listen to on a rainy night in a loud city surrounded by color and life. It’s better enjoyed with visuals, like all the songs on the album. “Gimme Your Love” sounds amazing. This is all I can really say about the song, it fits in with Luxury Elite’s previous tracks, while keeping Saint Pepsi’s usual funky and lively style of music, going so far as to sample “Give Me Your Love” by Pebbles (if I’m led to believe). “Angels” is the second to last song on the album, and samples a song by Andrae Crouch entitled “Got Me Some Angels”. It’s more of a funky interlude track, hence its short run-time and pop feeling. It’s definitely a great track on the album, and it would be my favorite on the album if it weren’t for one song. “Enjoy Yourself” is the last track by Saint Pepsi, and the last track on the album, ending it off with a bang by sampling “Off The Wall” by the King of Pop himself, Michael Jackson. It’s funky, soft, a definite dance floor track, sounding more and more classic with every listen and passing-by. It’s a vision into the future of vaporwave and how artists like Vektroid, 2 8 1 4, telepath telepath, Luxury Elite, and Saint Pepsi molded it into something incredible worth listening to in one full sweep, just like life itself.